In February 2014, Nigel Lawson and Brian Hoskins (Chair of the Grantham Institute for Climate Change) appeared on the BBC’s Today show to answer whether there was “a link between the rain in recent days and global warming”. Lawson, an experienced man of affairs though not a “climate scientist”, briefed himself on the matter and gave an answer was in accordance both with the findings of the most recent IPCC report and even with Hoskins’ own prior statements. In contrast, Hoskins, though an eminent climate scientist, gave a woolly response that quickly digressed into Green talking points. Steel went on to make other adverse findings against Lawson. However, in respect to the issue raised by the programme – the “link between the rain in recent days and global warming” – Lawson’s views were supported by scientific research, while Hoskins evaded a direct answer, instead quickly digressing into green talking points not directly to Somerset rainfall. The Today interview in controversy is available in transcript here and audio here. In January 2014, the UK had experienced intense precipitation – 185.1 mm, ranking in the top percentile of UK rainfall months – 16th in the historic series reaching back to 1766, but nonetheless ranking behind four 18th century and three 19th century months. The rainfall was particularly severe in the UK southwest. Is there a link, Sir Brian, between the rain we have seen falling in recent days and global warming? Both Hoskins and Lawson gave answers to this question before digressing to their respective talking points. Trenberth et al. (2003) provided a physical explanation for why increasing atmospheric temperature might result in an increase in heavy precipitation and suggested that extreme precipitation should scale with the water content of the atmosphere (see also Allen and Ingram 2002). The water content has been found to scale roughly at the Clausius-Clapeyron rate of ~7% K^-1 based on both observational and modeling studies, with the possible exception of the drier land regions, where the scaling appears to be lower (O’Gorman and Muller 2010; Sherwood et al. 2010a; Simmons et al. 2010; Willett et al. 2007). Therefore, based on this hypothesis, one would expect annual maximum daily precipitation to increase in most regions globally at a rate of ~7% K^-1. While the IPCC anticipated an overall global increase of ~7% per deg C, it definitely did not expect such increase to be uniform: indeed, IPCC presumes that precipitation in some regions may not increase at all. Because GCMs are generally poor at simulating precipitation extremes (Stephens et al., 2010) and predicted changes in a warmer climate vary (Kharin et al., 2007; Sugiyama et al., 2010), they are not usually thought of as a source of reliable information regarding extremes. Reconstruction of past flooding from sedimentary, botanical and historical records (Brázdil et al., 2006; Baker, 2008; Brázdil et al., 2012) provides a means to compare recent large, rare floods, and to analyse links between flooding and climate variability. During the last few millennia, flood records reveal strong decadal to secular variability and non-stationarity in flood frequency and clustering of paleofloods, which varied among regions. In Europe, modern flood magnitudes are not unusual within the context of the last 1000 years (e. g., Brázdil et al., 2012). .. In the Alps, paleoflood records derived from lake sediments have shown a higher flood frequency during cool and/or wet phases (Stewart et al., 2011; Giguet-Covex et al., 2012; Wilhelm et al., 2012), a feature also found in Central Europe (Starkel et al., 2006) and the British Isles (Macklin et al., 2012). In summary, there is high confidence that past floods larger than recorded since the 20th century have occurred during the past 500 years in northern and central Europe, western Mediterranean region, and eastern Asia. Macklin and Lewin 2008 (EPSL) estimated UK flooding regimes through the Holocene, with their Figure 6 showing especially high flooding incidence in the LIA. Over periods of a century or more, evidence suggests slight decreases in the frequency of tropical cyclones making landfall in the North Atlantic and the South Pacific, once uncertainties in observing methods have been considered. Little evidence exists of any longer-term trend in other ocean basins. most continents confidence in trends is not higher than medium except in North America and Central America and Europe where there have been likely increases in either the frequency or intensity of heavy precipitation. UK concern over heavy January 2014 precipitation arose largely because of flooding in Somerset (see e.g. here). At the time, there was considerable discussion about the degree to which changes in floodplain management practices had made the region more vulnerable to heavy (but precedented) rainfall, as opposed to vulnerablity arising from supposedly unprecedented rainfall. 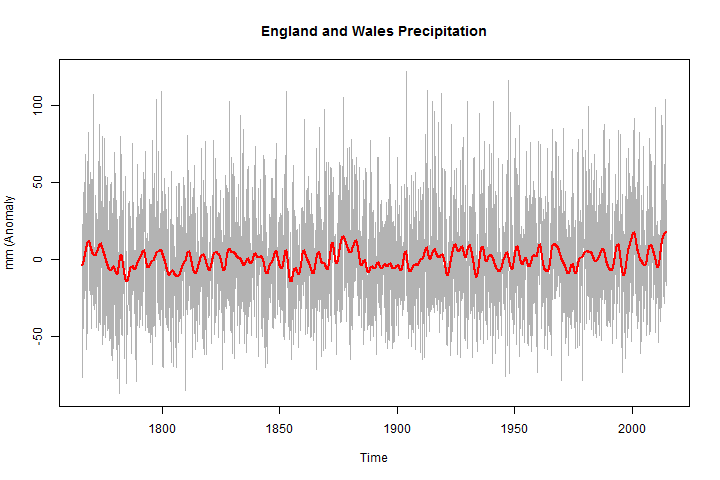 The UK has a long dataset of historic precipitation measurements: their England and Wales series goes back to 1766 i.e. commencing after the LIA extreme in the UK. Figure 1. England and Wales Monthly Precipitation Anomaly (1766-2014). 61-month gaussian smooth in red. I know that some scientists, like high profile NASA climate expert James Hansen, already say there is a definitive link between the occurrence of the extreme events and increase of greenhouse gases in the atmosphere. This does a great job of keeping climate change in the news, but to me it goes beyond what we can say with confidence based on current scientific understanding and evidence. One of my PhD students, Erica Thompson, has been looking into how extreme storms might change in the future but she has concluded that the models and records we currently have aren’t good enough to make a confident prediction. You often hear in the media that we’re going to get more and stronger storms, but maybe they know more than I do about it! Hoskins observed that many periods of extreme weather in UK latitudes came from “blocking highs”, observing that the cold UK winter of 2010 was accompanied by relative warmth in Greenland. Many of these prolonged periods of extreme weather in our latitudes occur because of an atmospheric pattern called a blocking high. Regions get stuck under the same weather system for entire seasons and this interrupts the region’s normal weather patterns….All the events we’ve seen recently have happened before; the question is whether we have altered the climate to the extent that they’re occurring more often or with greater intensity. After this brief review of IPCC positions on heavy precipitation and flooding, let’s now examine answers by Hoskins and Lawson’s to the question from the Today program presenter. Justin Webb, BBC: Is there a link, Sir Brian, between the rain we have seen falling in recent days and global warming? Sir Brian Hoskins: There’s no simple link – we can’t say yes or no this is climate change. However, there’s a number of reasons to think that such events are now more likely. One of those is that a warmer atmosphere that we have can contain more water vapour and so a storm can bring that water vapour out of the atmosphere and we’re seeing more heavy rainfall events around the world. We’ve certainly seen those here. Justin Webb: So it’s the heavy rainfall; it’s the severity of the event that points us in this direction? Sir Brian Hoskins: Well, in this event we’ve had severe rainfall but we’ve also had persistence, and that’s where I say we just don’t know whether the persistence of this event is due to climate change or not. While the IPCC relied on the Clausius-Clapeyron rate as indicating a ~7% increase in precipitation (and precipitation extremes) per deg C increase in temperature, the IPCC also emphasized that there could be major differences between regions. Indeed, in respect to the UK, they cited paleoclimate evidence (see above) which linked high UK flooding to cool periods rather than warm periods. But even if one applied the Clausius-Clapeyron rate itself to UK precipitation, the expected change in precipitation resulting from the observed increase in temperature of ~0.8 deg C is much smaller than internal variability of UK precipitation. For argument’s sake, applying the Clausius-Clapeyron rate to the observed temperature increas of ~0.8 deg C yields an expected increase of ~5.6% increase in monthly precipitation. Applied to UK precipitation, this would increase the median by approximately 4.1 mm (from 72.8 mm to 76.9 mm). For rare events (e.g. 185.1 mm), a ~5.6% increase in monthly precipitation would reduce the return time of a 185.1 mm event. Alternatively, a 5.6% increase would mean that an event that was formerly a 175 mm event was now a 185.1 mm event. In my opinion, one can argue that climate change might have marginally exacerbated the problem arising from an uncommon (but precedented) blocking high, but it is not possible to claim that the blocking high and related high precipitation was “caused” by climate change – a position that that is surely entirely consistent with Hoskins’ December 2012 interview. Certainly it is not the case, of course, that this rainfall is due to global warming – the question is whether global warming has marginally exacerbated it. Nobody knows that. The rest of the interview diverged away from links between floods and global warming to more general issues of extremes around the world, with Hoskins citing recent Australian temperature, Arctic sea ice, Greenland and West Antarctic ice sheets – all prominent green talking points, but not immediately relevant to precipitation and flooding in Somerset. Lord Lawson was obviously determined to dispute the science during the interview, despite his lack of expertise, and made a number of false claims which were not challenged or corrected by Justin Webb, the presenter who was carrying out the interview. In fact Professor Hoskins had laid out the scientific case very carefully, pointing out that it is not yet clear to what extent climate change may have contributed to the specific bouts of extreme weather that have occurred since late December, but also noting that the increase in intense rainfall that the UK is experiencing is likely to be the result of the warming of the atmosphere. On June 25, 2014, the Guardian published that Fraser Steel of the BBC Complaints Unit had written to complainant Chit Chong, a Green Party politician, stating that “Lord Lawson’s views are not supported by the evidence from computer modelling and scientific research”. In respect to the linkage between the floods and global warming, Fraser Steel’s views are unequivocally wrong. Even IPCC – surely the most fervent advocate of climate models imaginable – stated that GCMs did not provide useful information on precipitation extremes (and, a fortiori, floods). (Nor do the GCMs contradict Lawson since, as noted above, they show a lower than Clausius-Clapeyron increase in precipitation per deg C.) Nor does the Clausius-Clapeyron rate (referenced by IPCC) contradict Lawson, since, as noted above, it yields only a ~5.6% increase in precipitation for the 0.8 deg C increase in temperature – an increase that is much smaller than internal variability – entirely consistent with Lawson’s statement that the issue was one of “marginal exacerbation”. I have not parsed other issues in the interview: Australian temperatures, global heavy precipitation extremes, Arctic sea ice, as each involves its own issues, and because the focus of the interview was on the linkage of heavy January 2014 precipitation and floods to global warming. But clearly, inspired at least in part by Hoskins’ fellow Grantham Institute employee Bob Ward, the BBC has arrived at a factually incorrect and unfair decision in respect to the complaint against Nigel Lawson. Perhaps the person best placed to remedy the situation is Hoskins himself. Hoskins surely knows that Lawson was correct in his statement about the linkage between the floods and global warming ( the issue is “marginal exacerbation”). And in his statement about tropical cyclones. And about Chinese emissions. And that he has a legitimate argument on wind turbines. If Hoskins and the Grantham institutes want to persuade more people of the seriousness of the issues, Hoskins’ obligation is to do a better job, rather than have Lawson silenced by a Grantham apparatchik. I think that Hoskins should write to the BBC Complaints Unit, separating himself from Ward’s complaint and, at a minimum, conceding that Lawson’s position on the (lack of) linkage of floods and global warming is either correct or one that can be reasonably argued. It is, of course, vanishingly unlikely that Hoskins would do anything so gracious. Hoskins was the go-to person for the University of East Anglia when the Royal Society laundered the list of articles for the Oxburgh inquiry: although Hoskins himself had no informed knowledge of the literature, he immediately endorsed the UEA. Later, he acted as a supporting authority for refusing FOI requests. This entry was written by Stephen McIntyre, posted on Jul 13, 2014 at 1:20 PM, filed under Uncategorized and tagged bbc, fraser steel, hoskins, lawson. Bookmark the permalink. Follow any comments here with the RSS feed for this post. Both comments and trackbacks are currently closed. To achieve this I spend a lot of time at the met office library and archives as well as other records offices looking at contemporary observations. Several things stand out, which I have commented on elsewhere. The first is that of all the weather states recorded in the archives, by far the most notable are the huge number of extreme examples of flooding in England. The second thing of note is that the most extreme examples of flooding occur during the episodic periods of cold within the early stages of the development of the LIA. This is roughly the period 1200 to 1280 and again the period around 1320 to 1350 . The next fifty years can be seen to become much warmer and extreme events noticeably diminish in number and intensity. I have met up with various scientists at the MET office to point this out, but they are fixated on the idea that modern events are worse than historic ones and that science tells us this is because flooding in particular is related to warm,not cold, periods. As for the ruling on lord lawson at least it should mean that other non scientists, such as Lord Stern, will also not appear on the BBC? Steve: look at Macklin and Lewin 2008 here. The Guardian printed (leaked?) quotes from Fraser Steel’s report. Has the actual text of Steel’s report been released so we can see precisely what Steel objected to before concluding: “Lord Lawson’s views are not supported by the evidence from computer modelling and scientific research”. Fraser Steel presumably doesn’t know enough about climate to reach this conclusion on his own. What experts did he consult? Indeed. The BBC assuredly does not have the ‘in house’expertise they appear to consider necessary before an individual is permitted to dispute these matters in BBC channels. If they have a list of approved individuals, institutions, and qualifications, then I think they should make haste to publish it. If such a list does exist, then we can expect to see Al Gore’s name on it: On July 7th the BBC gave him an unopposed opportunity to regale us with his opinions about global warming. I guess the BBC has a variable interpretation of “due weight”. Is it possible for someone to file a counter-complaint? The evidence is all laid out right here. The “evidence from computer modelling” silliness has been explored (& mocked) in some depth at Bishop Hill. This sort of thing has an air of desperation about it: the alarmists can see that their dire predictions aren’t happening, the public is losing interest, and funding cuts can’t be far behind…. Steve: I try to avoid the generalized complaining about computer models that characterizes many blog comments. Nor do I share the aversion to computer models that animates many commenters. My point was entirely different: I directly quoted an IPCC statement that GCMs did not model extreme precipitation. That’s different from simply complaining. It’s a direct IPCC statement about the topic – a statement that can be held against BBC, whereas a complaint from a blog commenter cannot. While I appreciate Steve Mc’s logic and thoroughness in pointing out the flaws in the BBC position, I wonder if the expectation that the BBC has any interest in logic might itself be flawed. Steve says, ‘Nor do I share the aversion to computer models that animates many commenters.” I am surprised to hear you state this. Clearly they have been shown to have no skill. do you agree? +1 to that comment. On that note, I’d be interested in someone doing a serious write-up on Rahmstorf 2012 (where the authors “unskew” the climate models). The big question has always been: does increased CO2 in the atmosphere leads to serious climatic changes? Surely everyone can agree that that is a legitimate question. But how are we to answer such a question without the use of global climate models? The only real alternative is historical surveys of CO2 changes versus climate change, and these kinds of studies will always face difficulties finding accurate and reliable proxies for temperature and CO2 etc. Even then, only correlation rather than causation can ever be demonstrated. The only real game even in principle for definitively addressing the root question are GCMs that produce predictions that can then be tested against observations. One hastens to acknowledge that the mere construction of GCMs shows nothing. It is entirely possible and even likely that existing GCMs “lack skill”. That however, is an entirely different thing than rejecting out of hand the whole scientific enterprise of GCM construction. Steve: blog editorial policy discourages attempts to prove or disprove models in a few sentences. The issue is important but too often coat-racks on blog threads. I ask readers not to respond. This looks to me like a pretty damn “generalized” DEFENSE of climate models not in “few”, but in just one sentence. I do not share your interpretation of what Steve wrote at all. The statement clearly refers to computer models in general, and not to climate models specifically. I would understand Steve’s statement to apply to those persons who would argue that all models should be rejected simply because they are computer models, rather than arguing on the specific failings of a given climate model. The former offers nothing to the conversation and can quickly turn into a personal rant. In no way can this be construed as a generalized defense of climate models. So ‘not sharing an aversion’ is the same as ‘proving’? Steve, UK rainfall is a tricky one, a lot is not as claimed and nor is the data particularly reliable, all very long stories. I did look at the long dataset, concluding it is iffy. On the other hand I put a lot of time into a work on all the datasets commencing 1910, which the Met Office tend to make a fuss about. Even here it is a minefield, not to be trusted. Particularly the rainfall pattern across the UK has an awkward regional split. The British establishment did drag out data from a station where public data is withheld, what a surprise, Radford Obs., Oxford, made a fuss about that. Detail work based on various historic sources would be able to show how valid that is if anyone has the time. I live not far away and can point at notes of bridges swept away, high floods predating 1766. Floods happen, look at the Met Office’s own freely available data for Wick. Or the East Anglia record. Then follow to contemporary records. Somerset was not in the area of most exceptional wet. It was a wet year in combination with mismanagement. Amusingly I could show photographs, copyright excepted, from before 1910 showing there is nothing unusual in recent events where there is claim. For that matter I have personally seen very similar flooding. A factor which is all too often ignored is noise applies in all dimensions so there is timing scatter as well as amplitude scatter, one reason why Nyquist should not be ignored. It is by placing human hard walls on time, month, season, year and so on. It is this which can lead to silly claims with a good example an annual cold snap most often occurring during Jan/Feb but something during December. Result there can be a year with none or with two cold snaps… go figure. Longer term it has no effect, sure causes moaning in wiggle chasers, it is weather. 2013/2014 rainfall seems to have been a little late. Normally there is a sharp drop in rainfall as the winter circulation patterns appear. Was a little late. We know about the exceptional Atlantic pattern too. Abnormal change, wiggle panic, I doubt it. PDF there holds all 17 regional results. We Brits should be hanging our heads in shame that it takes a Canadian to produce the analysis which demonstrates so clearly the stealth censorship at the BBC. The decision by Fraser Steel of the BBC Complaints Unit was in line with Steve Jones’s report for the BBC Trust which recommended sidelining criticisms of the official position on climate change on the spurious grounds that they emanated, not from honest sceptics, but from deniers like Lawson, Montford and Monckton, who were named and denigrated in his official report. Much of the criticism or the BBC’s coverage of climate on British blogs (e.g. at BishopHill) is based on a libertarian opposition to the very idea of a state broadcasting body. But that’s what we’ve got, and it has the immense advantage that we have the right, as citizens, to demand that it represents the views of its audience. The BBC, unlike commercial media, has a host of checks and balances that are supposed to promote honest reporting. They’re not working. It would be the simplest thing in the world to form an association dedicated to putting pressure on the BBC to make it work. I’ve several times at Bishop Hill proposed forming such an association, always to be met by the refusal of a majority of commenters. Entirely agree Geoff. And I accept the snip with the same equanimity if it comes. Oceania is at war with Eastasia. It has always been at war with Eastasia. Steve – As always, you have the coolest head and the sharpest points in these arguments. Your analyses of IPCC pronouncements and Sir Brian’s previous positions are game, set and match. Or would be, if the BBC hadn’t already taken its balls and racket and gone home! It’s not a bad analogy, majormike, but we’re standing shivering on the court while the Beeb have already repaired to the club rooms for a nice G&T mainly because they don’t think we’re worth playing but also because they’re a bit afraid we might get lucky and spoil their unbeaten record! cycles and then associated with the most extreme heat: 117 deg F on July 4, 1984 in the Mojave. January 1974, we had to stop a golf match at the golf course on Kadena AFB, Okinawa due to 1 ft of casual water, ergo, a river was flooding the 10th green.I have seen many types of floods, not sure if I could categorize them as originating from one main source. I was at Ft Irwin for 30 days of training in August 1983. During that time it rained like hell. We were told it rained more in two weeks than it had in the last 7 years combined. Don’t know if that was hyperbole, or what. I do know that training was frequently suspended due to flash flooding. I went to Okinawa as a US Marine in 1959 The day after I got there, typhoon Charlotte hit (appropriately named, as I am from Charlotte). You did not leave your quarters on Okinawa on any day without a raincoat and a rain hat. At one point during my tour there we had five major typhoons bearing down on us. And it was hot as hades. In 1968 or 1969, I was attending high school in suburban Santa Barbara CA (Carpinteria). It seemed like it rained for 30 straight days. (Not heavy rain, just steady misty-like rain). The flooding was tremendous. There was a small creek (maybe 3 feet wide and normally dry) about 100 yards from my high school. It flooded and overflowed about 18 inches of mud into my high school’s classrooms. Another normally placid small creek became a raging torrent of water and logs that emptied into the Pacific. Step 2. The BBC response is comprehensively demolished. And the author can’t resist saying that the IPCC is ‘surely the most fervent advocate of climate models imaginable’. So don’t break blog guidelines and get into general issues. The BBC has been handed its hat. Learn from what Steve did here and become far more effective. Sorry, far more effective at what exactly? Many other Forum owners had already proved boyond doubt that the Floods were not “Global Warming” related using the Met Office’s own data and referenced the IPCC. Far more effective at answering the question “Was Lawson right about the UK floods?” And by extension whether Fraser Steel’s statement about Lawson and Hoskins was correct. What this thread is about. Furthermore such a focused argument is likely to be far more effective in any comments made to the BBC, Steel and Hoskins. According to christopher booker the somerset floods were due to eu regulations which wanted the area to flooded for birds. Read his article. The flooding of the Missouri River in 2011 was due to the refusal of the govt to reduce water levels behind the dams despite the massive snowpack. Then the rains came. Under the revised environmental guidelines, the flooding is a good thing. Not so much for the millions of people whose lives were wrecked. A contributory factor, but not the main reason. The Levels have always flooded, however, not as badly as recently. Note also that the BBC utterly neglected to mention – anywhere, radio, internet and, I believe, TV (we don’t have one) – the EU Wetlands Directive. Five months after lodging a complaint with them regarding this – all the other major news outlets paid varying levels of attention to it – I finally had a response. A totally unsatisfactory one. A logical cogent rebuttal of the BBC’s unfair decision, and very good it is. However, hell is the impossibility of reason and all it needs added on top is the religious spin associated with the cult of global warming. The Age of Unenlightenment. But clearly, inspired at least in part by Hoskins’ fellow Grantham Institute employee Bob Ward, the BBC has arrived at a factually incorrect and unfair decision in respect to the complaint against Nigel Lawson. Q38 Ian Lavery: Professor Hoskins, the Grantham Institute, the LSE have defended the IPCC and argued that some of those sceptical of its work have been guilty of misleading the public and indeed policymakers. Would you like to elaborate on that? Professor Sir Brian Hoskins: Sorry, what did I say? Professor Sir Brian Hoskins: I am at the Grantham Institute at Imperial, so I am not responsible for what LSE say. In which (notwithstanding his general endorsement of the IPCC), Hoskins provides further indications of his discussions and agreement with skeptics. Professor Sir Brian Hoskins: Can I come in on that? I think what we have seen from the models over the years and from the IPCC is a projection of a climate where the circulation of weather stays the same but the whole system is warmer so you [get] a bit more rain out of it and so on, but there is no confidence yet on how things like the El Nino, the circulation or the storm track that affects us might change. Again, entirely consistent with Lawson’s “marginal exacerbation” statement. and noticed an “aside” by Prof. Hoskins in answering question 35 – concerning the implementation of the IAC report on IPCC processes in AR5. “not everything has been followed but I would expect by the next one, IF THERE IS, they would be”. Possibly a plausible forecast at last. Thank you for this forensic examination. to construct a robust complaint which the BBC will not be able to ignore. If the BBC has now banned information inconsistent with the ‘evidence from computer modelling’, that rules out citing the HadCRUT4 and HadAT temperature series on air. Theirs is a genius decision, because there is no evidence from computer modeling. BBC policy cleverly allows BBC to say whatever they like. Models do produce evidence. In my work we most certainly include model output as evidence. Suppose you discover that a structural member on a steel bridge is bent. Did something hit it or did it buckle under excessive load? You might construct a finite element model of the bridge. If the model shows that under the most likely high-load scenario, the bridge will buckle in exactly the same location and orientation that you saw on the actual bridge, that is very strong evidence of what happened. The model may be wrong and that may have led to the wrong answer, but the output from an honestly constructed model is still evidence. Most types of evidence trump model output if the two types of evidence contradict, but there are even less reliable forms of evidence such as anecdotal. The wicked problem in climate science is that empirical (input – output) testing is impossible, meaning that – at least in this engineer’s viewpoint – “high confidence” in any prediction is simply out of reach. In order for a flood event to be caused by global warming, the event has to occur in a highly populated and well-educated area. Witness the fact that all this discussion centers on precedented flooding in Somerset and environs in January, while another location on the globe was just digging out from its wettest December ever recorded. But they won’t be discussing that on the BBC, because those rains were only felt by a few widely dispersed and savage tribesmen. I’m talking about Scotland, of course. Regarding the 7% increase in moisture per degree C of warming, keep in mind that with global warming the entire atmospheric column warms, not just the surface. So, a warm-world parcel of air at the surface rises into an atmosphere that is also warmer. Due to that upper-air warmth the parcel likely would not cool as much and condense as much moisture as it would have prior to warm-world. Steve: I wasn’t trying to assess the validity of Clausius-Clapeyron (though I would be loathe to presume that IPCC scientists had not considered the effect that you raise in here in formulating their rule of thumb.) My exercise was different: I was merely trying to assess the statements by Lawson and Hoskins in light of IPCC’s position. The Clausius-Clapeyron quantification shows that the impact of any increase (stipulating the IPCC formula) is much smaller than internal variability of the series – thus showing that Lawson’s position was not “wrong” according to IPCC. David Smith raises a good point, but 7% is still roughly correct. Let’s assume that floods in England used to be caused by air saturated at +5 degC with water vapor (8.72 mm) rising to where the temperature is -25 degC (0.81 mm). If the lapse rate were 6.5 K/km, that would be a 4.6 km rise. The result would be 7.91 mm of water vapor pressure condensing. Today the same storm would involve air saturated at 6 degC (9.34 mm, 7% more) rising to where the temperature is -24 degC (0.883 mm, 9% more). The new result would be 8.46 mm (7% more) of water vapor pressure condensing. Steve: in respect to UK rains, storm tracks are expected to move poleward with global warming. I presume that there is some sort of latitudinal gradient in rainfall which would have to be considered in estimating/guesstimating changes in rainfall. I presume that this sort of factor would be involved somehow in the apparent high incidence of UK flooding in the LIA. Steve: Models indicate that the Hadley cell is expected to expand on a warmer planet. As the downward branch of the Hadley cell moves poleward, the arid area below should move poleward and the temperate zone weather fronts and storm tracks won’t reach as far south as in the past. Beyond that, I’m unaware of a reason why temperate zone storm tracks will move poleward and England is far away from the descending branch of the Hadley cell. The evidence that the Hadley cell has actually moved poleward in the NH is pretty slim. During winter, rainfall clearly defines the northern limit of the descending branch of the Hadley circulation (which hasn’t moved). During summer, the boundary is poorly defined and it may have moved (causing a very modest decrease in precipitation). If the amplitude of Rossby waves is being increased by GW, then temperate zone weather systems following these waves are going to be directed further south (and north) than usual. If we don’t mind being inconsistent, we can blame both floods and droughts on GHGs, not to mention last winter’s polar vortex. Lawson mentioned the one phenomena we are sure of – 7% more condensible water vapor for every degC the air warms. He neglected to acknowledge some alarmist hypotheses about how AGW MIGHT influence extreme weather. It includes some of the listeners’ comments, which will give you an idea of the general mindset. There are whole blogs devoted to some of the BBC’s political bias in its coverage of issues. Sadly no complaint ever seems to change matters so I doubt SM’s careful analysis above will be considered either. For “Editorial Complaints Unit” (in my comment above), read “Editorial Standards Committee”. Great post Steve. As usual you outwork and outthink everyone. I am sure that Nigel Lawson appreciates the help. If I recall correctly, the UK floods sticks in most people’s minds because of the impact of flooding in the Somerset Levels. Flooding there has been known for hundreds of years and substantial infrastructure was built as adaptation to periodic storms and the resultant flooding. Until the EU decided that wildlife was more important than people. And until the UK minister responsible for maintaining the infrastructure agreed and then decided to implement EU policy and discontinue maintenance of the infrastructure. The disruption of life styles and the damage to property in the Somerset Levels was a direct consequence of Her Majesty’s Government’s interpretation of an EU directive and a failure of UK law to trump EU law. If the inhabitants of the Somerset Levels may be deprived of their legitimate expectations that the flood control will be operated properly, then the same should apply to the Dutch who live in the polders. Why has not the government of the Netherlands insisted that the provincial government(s) responsible for the dykes cease maintenance to allow wildlife to flourish that have been banished from the polder regions for centuries? 05:20: Greenpeace was quick to welcome reports of Environment Secretary Owen Paterson’s sacking. “So for now at least, the badgers have outlasted Owen Paterson”, said its executive director, John Sauven. It was the badgers and the Somerset levels that probably did for Paterson – in which case EU directives having been applied strictly, in a way the Dutch would never do, long before he was appointed Environment Secretary, have put paid to one minister with an open mind about whether climate policies currently conceived are well founded. This of course earned him the ‘denier’ label from the Her Majesty’s leader of the Opposition and a long-running campaign of vilification from the likes of Greenpeace. Was the BBC too quick 50 minutes ago to report Greenpeace’s welcome for the news? Such ‘bias’ is incredibly hard to nail down. That’s what’s so significant about what Steve has done in this thread. It’s clear what the BBC said in judgement about Lawson and Hoskins was ‘unequivocally wrong’. We may still lose the battle but if we fight with pitchforks when we have a howitzer available more fool us. That item can be found in ‘Live Text’ on the left hand side of the page Updates as Cameron reshuffles cabinet. If you haven’t seen it try this: Booker: Somerset floods – a very European disaster by Richard A E North (there’s more than one Dr Richard North engaged in the blogosphere). BTW, both he and Christopher Booker are close colleagues and are excellent at uncovering rats. North is a researcher but both are excellent at seeing through the massive fog jointly created by the media, NGOs, tranzis, the shell operation in Westminster (the EU’s local banch here) and the bureaucrats operating our (no longer quite so geheime) Übergovernment in Brussels which is full to the brim with klimate-change fanatics. Disclaimer: they are both strongly against Britain’s membership of the EU, as am I, but in my case ‘strongly‘ understates it. The rain it’s plain falls mainly unexplained. The Australian temperature record is demonstrably flawed. Colleagues are working up yet another set of examples, with the knowledge that you can speak without being heard. The forthcoming set will show unequivocal official adjustment of past temperatures in the “cooling of the older” style. As to floods, Brisbane, Queensland had substantial flood damage despite the Wivenhoe flood mitigation dam. On 11 January 2011, Wivenhoe Dam reached its highest level ever, 190% of normal water supply storage capacity, as it held back floodwater that later caused damage. As reported a few days ago, a very large class action is set to start on behalf of victims of the floods. While the dam factor is a complication, this note is about geography. Brisbane has coastline to its east. About 100 km west is Toowoomba, which sits on the edge of a N-S geographic divide. Rainfall to the west of Toowoomba drains away to the west. To the east it has the potential to flood Brisbane, dam or no dam. In 2011, most rain was to the east of the divide. If the storm centre had been displaced 20-50 km further west than where it was, Brisbane would probably not have had severe floods. This has the consequence that modelling to do with this flooding has to have a resolution capability of the order of a 10 km grid cell, or less. To my knowledge, modelling is much more coarse than this, partly because of computer capability at such small grid size. There are many, many examples of Establishment climate work driven by a tension to show that recent times are more extreme than older times. The problem is not to demonstrate this failing. The problem is to express it to those who need to know. In this regard, the surgical case presented by Steve above is a model of deduction, but with the problem of who will learn from it among those who need to learn. Have you forwarded this article to Fraser Steel (cc’d to Tony Hall) and Professor Hoskins? If not, I think it is unlikely that either of them will read it and Hoskins certainly won’t know that you think he needs to dissociate himself. The BBC found Lawson, not Hoskins, guilty of misleading the audience. The most important questions therefore revolve around the accuracy of the complaints about Lawson’s remarks, the process by which Steel evaluated those complaints, and the accuracy of Steel’s conclusions. Unfortunately, we know nothing about Steel work except the one sentence leaked to the Guardian. Unless you have filed a complaint with the BBC about the accuracy of Hoskin’s remarks, his mistakes are mostly irrelevant. His mistakes do provide a standard by which we can judge the severity of Lawson’s alleged distortions. Unfortunately, there is a double standard operating here: The slightest mistake by a skeptic who is not a professional climate scientist is far worse than the grossest distortions from an activist climate scientist. Steve: It would be nice if skeptics could be meticulous, but the problem is the double-standard. A climate scientist like Hoskins can express opinions that differ from the IPCC’s or distort or even dissemble without the assumption that his actions are politically motivated. When convenient, the press assumes (as Stephen Schneider put it) that scientists tell the truth, the whole truth and nothing but the truth with all of the caveats; and not “scary stories” etc. Lord Lawson’s (and other skeptics’s) message is politically-motivated by definition. I don’t think Lawson was “exactly right” (see Ward’s complain for questionable areas), but his position was more accurate than Hoskins. I think he was correct to say was that record of global warming (which is likely mostly due to man) indicates that moist air masses approaching Britain contain about 5% more water vapor than they did a half-century ago and that likely results in 5% more precipitation. But, no one has said whether the North Atlantic was or was not warmer than average when these storms were forming and whether the observed deviation from normal was significant (in terms of standard deviation). And the butterfly of chaos flapping its proverbial wings is as responsible for modest deviations from normal as GHGs. However, Lawson missed the fact that the type of flooding that occurred in England (as well as drought, heat waves and cold spells) is caused by unusually stable weather patterns (arising from Rossby waves). There are theories, but no IPCC consensus on how rising GHGs has or will change the frequency stationary weather. Lawson also missed the most important fact: man’s alternation of land (impermeable surfaces, drainage ditches, agriculture) and watercourses has had far more impact on flooding than climate change. Most “natural” drainage disappeared long ago. The British government had opportunities to mitigate to mitigate the impact of this once-a-century rainfall and hadn’t taken appropriate action. As best I can tell, the uncertainty in measurements of OHC prevents anyone from concluding that the heat that is “missing” during the hiatus has ended up in the deep ocean. I don’t think Lawson was “exactly right” (see Ward’s complain for questionable areas), but his position was more accurate than Hoskins. But Steve had just said something much more precise and, in the context, important: “in respect to the rains, it seems to me that Lawson was exactly right”. I think he was correct to say was that record of global warming (which is likely mostly due to man) indicates that moist air masses approaching Britain contain about 5% more water vapor than they did a half-century ago and that likely results in 5% more precipitation. But Lawson didn’t say anything like this. Rather than putting words in his mouth might it be better to quote what Lawson said about the rains, then try to show where it wasn’t exactly right? Richard: Thanks for your critical comments, which were justified. I ASSUMED that Lawson’s phrase “marginally exacerbated it” referred to the 7% more absolute humidity one expects to find in saturated air which is 1 degC warmer (C-C eqn). Over a half-century, I estimated this would be a 5% increase in absolute humidity. I should have looked up Lawson’s exact words (like Steve would) instead of relying on my memory. However, I don’t think I made an unreasonable interpretation of his statement. Where, precisely, did you find Fraser Steel’s statement on this particular aspect? It wasn’t in the Guardian article. It will take a while to go through those three examples – I do not think any of them are “obviously untrue” but do you agree with Steve that “in respect to the rains … Lawson was exactly right”? Given that this was the original subject of the discussion. Richard Drake, SMc’s article appears wrong because it is focussing on the wrong thing. Parsing their statements, Lawson and Hoskins were aligned on the rain, though with a differing emphasis. Lawson took the opportunity to make misleading statements that were driven by his political opinions, which underlay what the complaint was about. I also disagree with you that Hoskins and Lawson were “aligned” on the rain. Lawson said that the salient question was whether “global warming marginally exacerbated” the problem. From my reading on the problem and my understanding of IPCC positions, this seems exactly right. If Hoskins agreed with this statement, then he had an opportunity to express this agreement and ought to have done so. He didn’t. Instead, he wandered off into talking points like Arctic sea ice and Australian temperatures, neither of which are directly relevant to Somerset rainfall. The interview was never going to be specifically about the flooding as it’s reasonably well understood that the standard answer is that “No one weather event can be ascribed to global warming”. The discussion was always going to be about probabilities and risks of such events. The Today programme is a relatively high-brow programme that commonly presents rational discussions of controversial topics that go beyond the current affair that gave rise to the discussion. Lawson’s statement massively simplifies the problem in a way that is unhelpful to the listener, in my view. I think it would have been easy to find two scientists who could express the range of views and the issues that make the problem of attribution difficult. It is the scientist vs politician scenario that is more likely to lead to “activist” statements. If #1 is not accepted by the IPCC, it’s a sign of their incompetence. For #2, Trenberth’s 10^22 kJoules of excess thermal energy works out to about 0.001 C increase throughout the top 700 m of the world ocean — merely several hundred times less than the limits of resolution of the best buoy temperature measurements. It could not have been detected, and must therefore be pure speculation. And #3, one is hard pressed to find misleading a statement that is true. There has been no increase in weather extremes over the past century. So you accept that Lawson’s statement was provably wrong. Therefore it is possible to find a misleading statement that is true. For further on this see my reply to Craig below. Huh? Did you read Pat Frank’s statements exactly upside down? Lawson was provably correct, not wrong, on #1 and #2. Mr. Pete is dead on. I accept that you have observably misappropriated every one of my points. The IPCC does not accept what Lawson claims. So Lawson’s statement is untrue. I misread the Pat’s argument 2. Sorry. Pat’s argument is misplaced as you can measure temperature changes to that level of precision with sufficient sampling. Standard error analysis in physics. Are you saying what I think you are saying? You may be able to measure mean changes in temperature of that magnitude in a carefully set up laboratory physics experiment using “standard error analysis”, but you are naive if you believe that this sort of precision could be achieved for ocean heat. Your statement that we observed a “rate of warming over the past 15 years (1998–2012; 0.05 [–0.05 to 0.15] °C per decade)” implies that the the standard error of the estimated rate of warming (which incidentally is not significantly different from zero) is approximately 0.05 °C per decade. In order to just reduce that standard error of surface warming to .001 would require about 50^2 = 2500 times as much independent information as was available to produce the original estimate. To have a shot at testing whether the rate of change is greater than zero when we are considering such minute differences would require about 6700 times as much information. And you believe that it is possible to do that for the ocean depths with its sparse set of measurements? The data have been examined by several groups and they are all coming to similar opinions – even those that previously claimed the oceans were cooling. The data is aligned with observations of sea level rise and changes in land ice/water. Anyway, I think 10^22 Jules in 700 metres of water is about 0.01C, and in the last 17 years, OHC has gone up by about 7*10^22C – feel free to correct my arithmetic. Lord Lawson is correct. Most scientist do not have a clue on the cause of the warming of the North Atlantic Ocean in 2012 and 2013. This is not global warming but regional warming due to the submarine eruption of the El Hierro volcano in the Canary Islands. The eruption from October 2011 to March 2012 led to numerous major climatic impacts within the North Atlantic Basin. Very few people are aware of this. Thanks for the pointer on the El Hierro volcano, I am off to learn more about it! – Sorry. Deleted for use of forbidden word “cr…sm”. Zero tolerance. You could have just deleted the word. Zero tolerance, by the way, allows no room for ethical judgment. I have not followed this thread closely but the latest speculation about extreme shorter term weather comes from the jet stream stalling in meandering patterns as opposed to straighter west to east directions (at least in the US). Further it is speculated that with the recent years of Arctic amplification that the temperature differential between the Arctic and the equator is less and that can slow the jet stream and allow more of the meandering pattern. It sounds to me that these latest conjectures are after the fact theorizing – which does not necessarily make the conclusions are wrong but rather speculative as this time. This mechanism will no doubt in my view be used to explain any unusual weather patterns like the polar vortex that gave an unusually cold and snowy winter in the Midwest of the US where I live and to explain our autumn like weather this week. “With their study, the authors highlight the importance of quasi-stationary waves in causing extreme surface weather. This is an important step forward, but of course many questions remain. Has planetary wave activity changed in recent decades or is it likely to do so under projected future warming? And, if it is changing, is the rapid Arctic warming indeed responsible? Clausius-Clapeyron is an equilibrium thermodynamic relationship. Just about every process in the air-ocean system is far from equilibrium. So, its use in models is a travesty. Steve: as I observed in my inline comment to Pat Frank, contesting Cl-Cl is well outside the scope of this thread and unnecessary for the purpose of analysing Lawson’s comment. I request that no responses be made to this comment. Excellent work as usual, Steve. After having read the transcript, I can’t help but reflect on the rather poor quality of questions. The interviewer was driving the wedge between Hoskins and Lawson, when there was apparently room for both agreement and polite disagreement. It says a great about how far journalistic standards have fallen. I have been in this business for more than 35 years. I can’t imagine asking such asinine questions. Good point on the quality of the interviewer. But Steve earlier seemed to put the onus on the bulk of climate scientists – or was it perhaps the shared assumptions of climate scientists with BBC editors and interviewers? … the issue with linkage of Somerset floods and global warming is whether there is “marginal exacerbation” – a position that seems most likely to me based on my (limited) perusal of literature on the topic. One of the major problems with the present debate is that it appears to be extremely difficult, if not impossible, to get a “climate scientist” (other than regulars such as Lindzen, Spencer, Christy) to say that on the BBC. I’m sure that many climate scientists privately hold such an opinion, but it would be very hard for BBC to find one who was willing to contradict an activist scientist on the BBC. Agreeing with Lord Lawson. Surely, in this case, on the essentials of the marginally exacerbating role of global warming, at most, in the January rains in the UK, Hoskins did agree. But he could not be heard to say so. Not merely a problem with the interviewer and interviewee but a cultural pathology, where a man like Lawson is continuously vilified as a denier, thus making clear to anyone with a professional interest what will happen to them too if they are seen to agree with him. Add to that the nonsense of Fraser Steel’s response to complaints from the likes of Bob Ward and Chit Chong and there is close to total marginalisation, not of AGW as an explanation for our floods, but of those who seek to bring balance to the discussion. Still, the censorship may not yet be total, if the reaction of the editor of Today five days ago is anything to go by. Sorry to be off topic but I have a question. In my memory I remember the acronym CAGW being commonly used by proponents, and skeptics. I know there was, and are currently countless proclamations of catastrophe by the media, and scientist. However currently the warmist say that CAGW is a term used by the skeptics. They point to the IPCC using the term CC, for Climate Change since its inception. I know that most scholarly publications used most commonly the term AGW, or GW. Yet I remember may uses of the term CAGW by proponents. Did skeptics create that term? If you have any linked evidence I would appreciate it. Clearly the term CAGW is more accurate and pertinent, but I still need the history of the acronym. Yes, the acronym was invented by skeptics. But when the [late 1970s to late 1990s] media hyped about catastrophic global warming, they used those three words, with a possibly blander synonym of “catastrophic”. They didn’t mentioned the “anthropogenic” part so much, that was implicit on the message. Skeptics clarified a bit in their blogs and created the acronym. For instance, for Bourke (an Australian inland, hot & dry site), using raw data alone, annual rainfall (X) explained around 27% of the variation in annual max temperature (Y). Makes sense that dry years are hot years. I wonder if this apparent circularity is included in current thinking. It is more complex than simple classification of variables into dependent and independent. Anyone else done studies of this type? There’s a lot of muddled reporting of this story. Lord Lawson hasn’t been in any sense ‘banned’, and the Editorial Complaints Unit finding didn’t suggest that he shouldn’t take part in future items. It found fault with the way the Today item was handled in two respects: firstly that it presented Lord Lawson’s views on the science of global warning as if they stood on the same footing as those of Sir Brian Hoskins, and secondly that it didn’t make clear to listeners that Lord Lawson represented a minority view. There is also no ban on other non-scientists discussing climate change. So there you have it. The problem for the BBC is that their BBC Trust report (on science reporting) is muddled. Written by Professor Steve Jones, a geneticist, it suggests the BBC should not ask people with opinions on non-contentious science. The list Jones provides includes MMR vaccines, GM food and climate science. Apprently Climategate never happened. No doubt if Professor Jones had been writing such a report in 1905 he would have suggested not interviewing Albert Einstein (a mere patent clerk) about his paper on Special Relativity given that Newton’s universal law of gravitation is right based on the consensus, and is therefore non-contentious. Warren wrote: [the controversial show] “presented Lord Lawson’s views on the science of global warning as if they stood on the same footing as those of Sir Brian Hoskins, and secondly that it didn’t make clear to listeners that Lord Lawson represented a minority view”. So now skeptics will be allowed to speak only after being introduced in such a way that their words will be discredited even before they speak. Interesting.